PIX Premiere. Hold onto your hats! 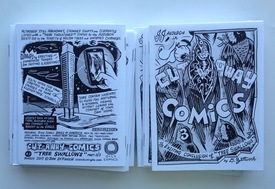 The looooong awaited third and final issue of Dan Zettwoch's CUT-AWAY COMICS has arrived - along with restocks of the first two issues! So, anyone late to the party can celebrate along with the rest of us. All issues are only $1@: Another spectacular Zettwoch Industries value!